I am a diehard Julia Child Fan. I've watched every single episode I could find on youtube of her cooking show, "The French Chef". When we lived abroad for a year in Europe Matt gave me cooking lessons at the school she trained at - The Courdon Bleu. And I've watched Julie and Julia at least 6 times. Diehard. 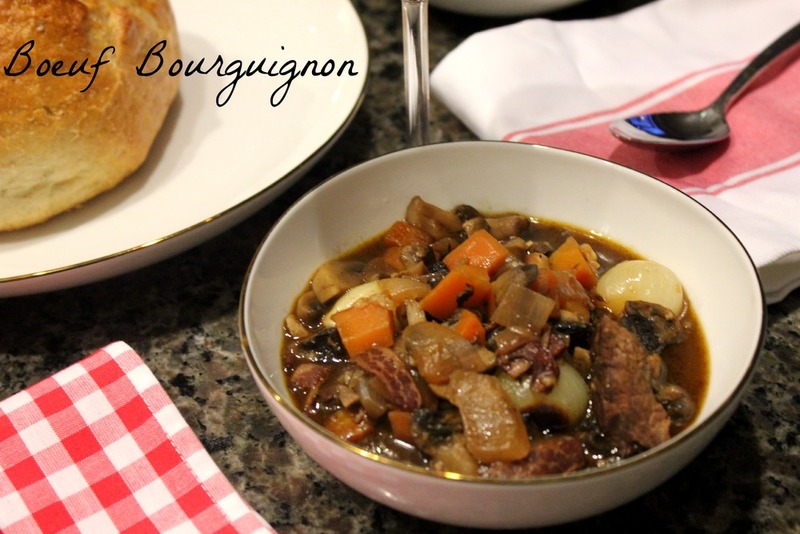 For YEARS I've been thinking that one day I would try to make boeuf bourguignon a la Julia. When I got a Dutch oven for my wedding I knew it was only a matter of time before I would finally make the boeuf! By the way boeuf is french for beef but I like the word boeuf better so I'm switching! We were at the St. Lawrence Market this past weekend, a market famous for it's amazing butchers, cheese, wine and food shops, it was time! The Boeuf Bourguignon was calling! I followed Julia's recipe but also mixed with a bit of Barefoot Contessa mixed with a bit of my own musings. One thing I really underestimated was how long the boeuf would actually take to prep. Seriously, browning boeuf is a real B. See you have to cut each piece into 1-inch chunks and then hand dry them with paper towel before you can even being to think about the four step turning process that is actually browning your boeuf. After two hours of what felt like non-stop vegetable chopping and boeuf tending dinner was finally ready! And it was honestly after all that the boeuf was well, meh. I mean, not bad but certainly not write home worthy... at first. BUT we had a lot of leftovers. So we had the stew for lunch yesterday and WOW. Total transformation! Seriously if I ever muster the energy to make this again I will wait a day to serve it - the flavour is just SO much better! I think it should be a rule in the directions that you must wait a day to eat this because honestly on the flavour scale it went from a 6 to a 9.8 in 24 hours. Delicious. In a large Dutch oven add diced bacon and cook over medium heat for 10 minutes, until the bacon is lightly browned. Remove the bacon with a spoon and place on a plate. Dry the beef cubes with paper towels (carefully - dry beef will brown WAYYY better!) and then sprinkle them with salt and pepper. In batches in single layers, sear the beef in the hot bacon fat for 3-5 minutes, turning to brown on all sides. Remove the seared cubes to the plate with the bacon and set aside. Do all of the beef. Toss the carrots, onions, salt and pepper into the fat and cook over medium heat for 10 minutes, stirring occasionally until the onions are lightly browned. Add the garlic and cook for one more minute - you don't want it to burn! Put the meat and bacon back into the pot with any juices that have accumulated on the plate. Add the wine plus enough beef broth to almost cover the meat. Add the tomato paste and dried thyme. Bring to a boil, cover the pot with a tight fitting lid, and place it in the oven for about 60 minutes, or until the meat and veggies are very tender. Meanwhile, take 2 tbsp of olive oil to a wok then add in your pearl onions and heat them over medium-low heat until they become translucent - about 20 minutes. Then add in mushrooms and cook them for another 15-20 minutes. Add this to the stew once it comes out of the oven. Then bring the entire mixture to a boil, lower the heat and simmer uncovered for 15 minutes. Season to taste. Serve with a slice of sourdough bread and a BIG glass of red wine!